Castile and León (Spanish: Castilla y León), known formally as the Community of Castile and León, is one of the 17 autonomous communities of Spain. It was constructed from Old Castile (Spanish: Castilla la Vieja) and León, first as a preautonomía—a "pre-autonomous" region—in 1978 and then as an autonomous community in 1983. It is the largest autonomous community in Spain, covering an area of 94,223 square kilometres (36,380 sq mi) with an official population of around 2.5 million (2005). The supreme law of Castile and León, under the Spanish Constitution of 1978, is the region's Statute of Autonomy. The statute lays out the basic laws of the region and defines a series of essential values and symbols of the inhabitants of Castile and León, such as their linguistic patrimony (the Castilian language, which English-speakers common refer to simply as "Spanish", as well as Leonese and Galician), as well as their historic, artistic, and natural patrimony. Other symbols alluded to are the coat of arms, flag, and banner; there is also allusion to a regional anthem, though as of 2009 none has been adopted. April 23 is designated Castile and León Day, commemorating the defeat of the comuneros at the Battle of Villalar during the Revolt of the Comuneros, in 1521. Castile and León borders on Asturias and Cantabria to the north; Aragon, the Basque Country, and La Rioja to the east; the autonomous community of Madrid and Castile-La Mancha to the southeast; Extremadura to the south; and Portugal and Galicia to the west. Castile and León is roughly coterminous with the Spanish part of the Douro River basin, on the northern half of the Meseta Central, a vast plateau in the middle of the Iberian Peninsula. 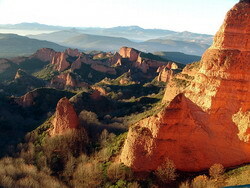 It also extends to some adjoining valleys, such as El Bierzo (León) and many secluded mountain valleys including Laciana (León), Valle de Mena (Burgos), and Valle del Tiétar (Ávila). 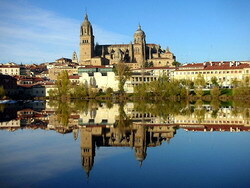 Astorga - Astorga is a small town and episcopal see, located in the province of León of Spain. 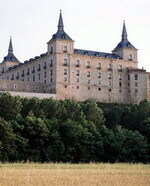 It lies southwest of the provincial capital of León, and is the head of the council (comarca) of La Maragatería. It is situated at 868 m above sea-level, and has an area of 47 km². The river Tuerto flows through it. Its population (2004) is about 12,207 people. The coat of arms of the town includes an oak branch. Astorga lies in the area of the Maragatos, a small ethnic and cultural community with distinctive customs and architecture. The Episcopal Palace of Astorga was built by Antoni Gaudí and is one of the major attractions today, appart from the town cathedral, of the Roman Catholic Diocese of Astorga. 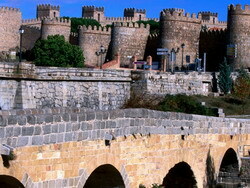 Astorga lies along the French route of the Way of St. James (Spanish: Camino de Santiago). Saint Turibius of Astorga was bishop of the city in the 5th century. 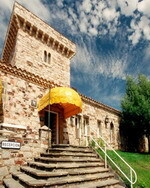 The Hotel Temple Pradorrey is located in the small town of Pradorrey, Spain, five kilometres from the historic sights of the city of Astorga. Leon is 62 kilometres away. 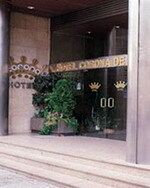 Astorga train and bus stations are five kilometres from the hotel. Built in the style of an ancient fortress, the hotel is situated in mountainous countryside. Guests can take coffee in the hotel lobby, which is characterised by suits of armour and medieval-style tapestry prints. Hotel Temple Pradorrey's onsite restaurant, with terracotta tiled floor and floor-to-ceiling arched windows, specialises in local Castilian dishes. Breakfast is available for a surcharge. Decorated in a Castilian style, the 64 air-conditioned guestrooms have pale pink walls, dark wooden furnishings including a high grid-patterned headboard, and floral bedding in pink and peach tones. 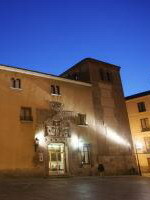 This hotel comprises a late 18th century building that formerly housed the Santiago Pilgrims Hospital, preserving the façade of the chapel bearing the same name, and an adjoining building created by the architect Cardenas in 1906. It is located in the city centre, just a few metres from the Cathedral, the Gaudí Palace and the Roman walls and has a large 19th century style garden. The meticulous care taken during the recent refurbishment has endeavoured to restore the architectural and historic features of the building incorporating all types of modern comforts to ensure a thoroughly pleasurable stay. León is 46km away and Ponferrada 50 km. 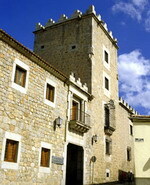 Visit the villages of the Maragatería region just 10 km from the hotel. The Palacio de los Velada Hotel is situated in Ávila city and neighbouring cities like Madrid, Valladolid, Salamonca and Segovia are located within one hours drive from the hotel. Whether one is in search of culture, nature or looking for a noble setting in culinary art, then Palacio de los Velada is the ideal one. Its professional staff are helpful and assures for ones successful meeting. An exquisite decoration, compatible with the nobility or stones makes each one of 145 rooms of the hotel unique and the facilities make ones stay more pleasurable and memorable. At the restaurant one will get the taste of the authentic regional gastronomy, its excellent meat and wide variety of specialities. This hotel is located just outside this lovely walled city. From this property, the clients can admire the walls when lit at night. 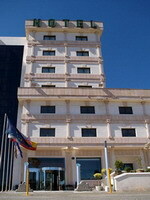 The location is just five minutes drive from the centre of Ávila. The bedrooms are large and well decorated with good modern functional furnishings and soft colour schemes in matching fabrics and wall colours. Bathrooms are medium in size and complete. The restaurant is traditional in style and decoration with fine and carved wooden chairs with robust wooden tables. The menu is traditionally castillian with a fine selection of international cuisine. The hotel also has cafeteria open during the day offering light meals in a less formal setting. This hotel offers excellent accommodation and its views of the city are unique. The Hotel Cuatro Postes is located in Avila, Spain, next to the Cuatro Postes monument, and one kilometre from the town's historic centre. It is one kilometre from Avila train station. This impressive stone-built hotel is situated next to the old city walls with views over the city. The Hotel Cuatro Postes Muralles restaurant opens onto a terrace and serves Spanish dishes. Drinks are served in the bar, which also has a television. Business facilities include a business centre and conference rooms. 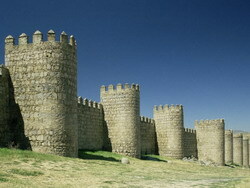 Avila's high walls are an invaluable testimony to fortifications in the Middle Ages. The best place to view them is by the hotel, but to get a real feel for them, take the sentry path along the top. 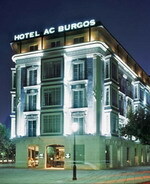 The AC Burgos is a modern hotel, with large windows and an imposing façade built in keeping with the surrounding historic architecture. The hotel is located in the centre of the town just 50 metres from the gothic cathedral. The AC Burgos Restaurant offers a modern fusion of nouvelle cuisine and traditional ingredients served for breakfast and dinner daily and lunch Monday to Friday. After a day's business or sightseeing guest can relax with a drink in the bar, or unwind in the sauna. Multilingual staff on the 24-hour front desk can help with advice on the hotel and the surrounding area. There is wireless Internet access in all public areas and garage parking for those travelling by car. Snacks can be ordered from 24-hour room service. The 70 guestrooms have light, modern décor with contemporary furniture. The Hotel Corona de Castilla is located in Burgos, Spain, within 500 metres of the city's historic centre and Burgos Museum, containing ancient relics as well as a fine arts wing. The Atapuerca Caves are 12 kilometres away, and Burgos train station is 500 metres from the hotel. Hotel Corona de Castilla's cornflower blue and chestnut-toned onsite restaurant serves international dishes for both lunch and dinner. A buffet breakfast is available (surcharge), and there is a cafe with lilac armchairs and wooden-panelled walls, which offers hot and cold drinks. The 83 guestrooms are decorated in light colours with patterned fabrics and wood furnishings. The Hotel Arlanzon is a centrally located modern property, set behind the San Agustin Monastery, 800 metres from the cathedral and Gothic quarter. The hotel is well placed to explore the area; the city centre and Las Huelgas Monastery are 800 metres away, and Cañon del Rio Lobos Nature Reserve is at a 40 kilometre distance. The hotel offers complimentary wireless Internet access throughout, complimentary newspapers are available in the hotel lobby, and there is a TV room. The hotel also houses its own bar and coffee shop, and those arriving by car will find garage parking available. The 83 guestrooms are decorated in light colours with patterned fabrics and wood furnishings. 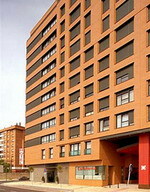 The Meliá Fernán González Boutique Hotel hotel is located in the heart of the historical and monumental city centre of Burgos. 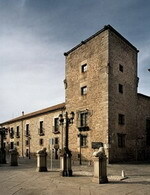 150 m from the Cathedral and just 5 minutes from Las Huelgas Monastery. The hotel has halls for meetings, events and banquets, with a maximum capacity of up to 700 people. In our restaurant, you will enjoy a kitchen that combines the Castilian tradition with new and exciting dishes. 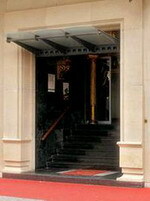 The Hotel has been renewed in 2007. There are 74 Rooms, 8 of which are junior suites. With a classic decoration, creating unique surroundings and with a special enchantment. 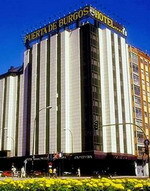 Zenit Puerta De Burgos is a modern hotel situated within 1.5 kilometres of cosmopolitan Plaza Mayor, the City Museum and Burgos Cathedral. The Atapuerca Archaeological site is 11 kilometres from the hotel, or guests can venture further afield to the medieval village of Covarrubias, 35 kilometres away. Guests can sample a breakfast buffet and, afterwards, relax and browse complimentary newspapers in the hotel lobby. The hotel's restaurant, El Porton de Burgos, offers a varied a la carte menu, as well as a set menu with 18 courses to choose from. Dishes ranges from local delicacies to more sophisticated Spanish cuisine. This 9-floor hotel features 115 air-conditioned guestrooms, all of which include satellite televisions, direct-dial phones, internet, minibars, and bathrooms with telephones and hair dryers.